The Enlightenment, a dram Voltaire would be proud of. The Enlightenment was a time when thinkers thought that perhaps the best way forward for mankind would be to bypass religious dogma and here now we have a whisky company which wishes to see an end to the traditional and bring forward a new dawn in honesty. Compass Box offers us as consumers the opportunity to purchase a whisky and actually know what’s inside the bottle, they do spin some lovely yarns but that’s okay too because the stories which go with the whiskies never get in the way of the whisky itself and aren’t being used to distract from a poor quality product. I would like to see all whiskies, all of them, offer the same level of openness that Compass Box have tried to do and of course have had their knuckles rapped by the Scotch Whisky Association after a complaint was lodged after Compass Box had the temerity to give us the exact details of what the blend actually contained. And now they’ve brought another two blends in part as an answer the way they were forced to remove age statements from their descriptions, the first of the two I will be reviewing is The Enlightenment, bottled at 46% will no chill filtration or colouring so we’re already starting off on a good note, it’s also sixty pounds a bottle which is excellent value for money in these current climes. This whisky contains Clynelish, Balblair, Mortlach and GlenTauchers, the only thing we don’t know is the age of each component, because we’re not allowed too but I’d say it’s not too old. Nose. Light fruity notes, Apple and cut pear, vanilla cream and something floral too, it’s very much like walking through a market filled with fruit and flowers. Palate. My first impression is waxy apples, there is a small amount of warm ginger spice, vanilla and more fruit, dried apricots, fresh apples and more pear, it’s a delight. Finish. A medium finish leaving those waxy apples, vanilla and floral notes. 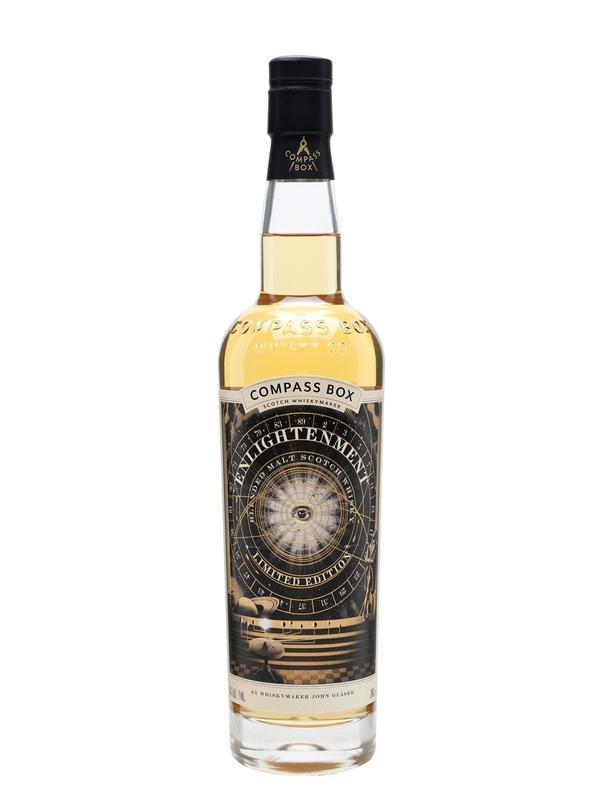 A lovely whisky, Compass Box have done it again offering a reasonably priced blended malt, which I’m beginning to think is my favourite style of whisky, in reasonably limited numbers so get in quick, I’ve already placed my order. Previous Have we reached peak Whisky madness? Next The Glasgow Distillery, a trip into the unknown.